Statement of #TindigPilipinas! 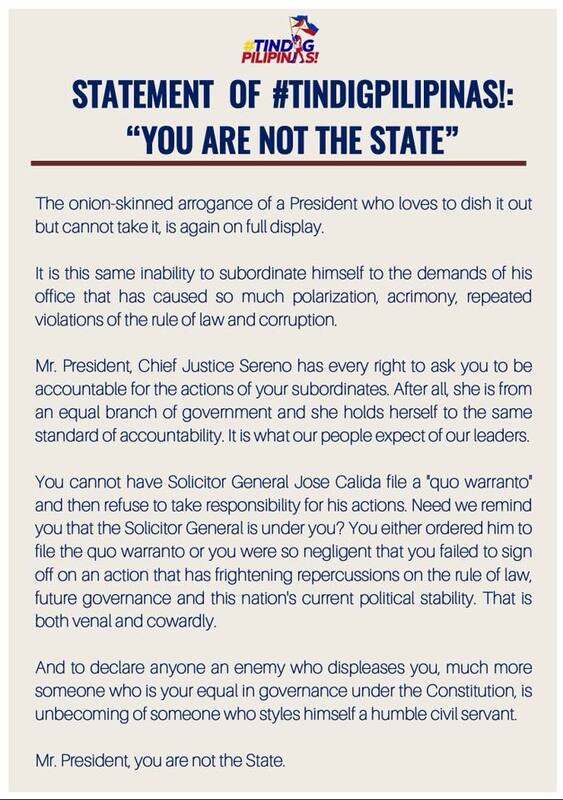 : "You Are Not The State"
ready smiles offering food to each other, flowers to soldiers, and prayers for the nation. of their dignity and treated with misogynist disdain. will usher in the Reign of God here and now! That change begins in me. cloud came a voice, ‘This is my beloved Son. Listen to him.’” [Mark 9:7]. Tinig ngbawat tao’y bigyan ng pansin. the earth shall find blessing.”[Genesis 22:17-18]. 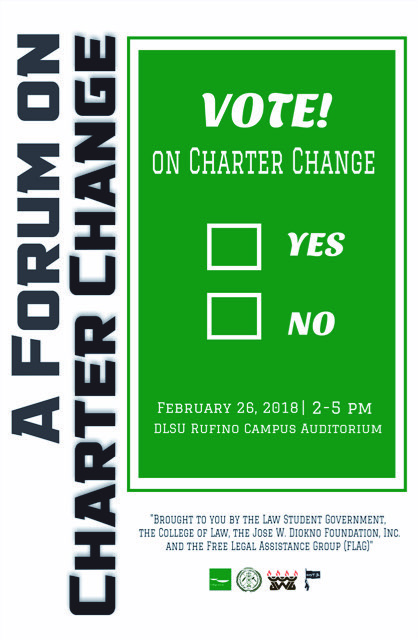 Please join us on a forum on Charter Change on the occasion of Ka Pepe Diokno's birth anniversary. DLSU College of Law, BGC Campus, 38th Street, BGC, from 2-5 p.m. on 26 February 2018. Organized by the DLSU College of Law, the Law Student Government, the Jose W. Diokno Foundation, Inc., and the Free Legal Assistance Group. he National Citizens’ Movement for Free Elections, the organization that started nonpartisan citizen monitoring of elections in the world in 1983, urges Congress to no longer postpone the holding of the two polls. The Commission on Elections announced that these polls are scheduled on May 14, 2018, and preparations are underway for holding them in over 42,000 villages throughout the country. “Free and fair elections are a precondition of democracy and they promote social, political and economic development”, according to the Bali Declaration by the Asian Network for Free Elections, of which Namfrel is a founding member. Having regular elections is an exercise of and in democracy and the current set of barangay officials, who have been in office since 2016, would need a fresh mandate from the people they serve. In a truly functioning democracy, regularly renewing the mandate of elected officials is an exercise of good governance. In a survey among Namfrel provincial and NCR-level chairpersons, many expressed that it is high time for voters to judge the performance of the barangay officials and to replace erring ones via the ballot. Postponing the elections, which Congress has twice done already, “brings about a sense of caution and instability” among the village officials. Those surveyed coming from Mindanao rated most municipalities in their respective provinces as safe to hold elections; and martial law, which is currently in place, do not seem to be an obstacle in holding the polls. Namfrel cautions that despite the supposedly non-partisan nature of the barangay polls, mayors and other influential political personalities have pre-chosen or preferred candidates, making it difficult or almost impossible for anyone to contest against them and still hope to win. Owing to dislocation of residents and the already stressed situation in Marawi city, Namfrel supports the position of the COMELEC to delay holding elections. The organization is very pleased with the approach that COMELEC has taken, which is to assess the situation on the feasibility of holding polls in the city within the next three months. The war on drugs waged by the government and the allegation that 40 percent of village officials are involved in drugs are destabilizing factors. It has painted all the village officials to a corner where they are forced to draw a list of residents within their barangay who are suspected of involvement in drugs. They get the ire of the residents (voters) for forcing to come up with a list, on the one hand, and being tagged by the government as one among the 40 percent, on the other hand. Namfrel observed that the Sangguniang Kabataan (SK) has been used by adult politicians for their purpose, and such has impeded in the role of the youth body in serving the interests and welfare of their constituents. “The SK is a tool for corruption and the youth are trained early on how to be corrupt,” opined one chapter officer. Some are of the opinion that the SK should be abolished altogether, citing that while in the Declaration of Principles and State Policies in the constitution cites the contribution of the youth in nation-building, such intents could be better realized elsewhere like in schools or in larger civil society. Republic Act 10742 passed in 2016 introduced new features. It prohibits those related within the second degree of consanguinity and affinity with any elected officials from seeking any position in the SK — an anti-dynasty provision. It also created the Local Youth Development Council, and requires leadership training of all SK officials on good government and fiscal transparency. Namfrel sees independence and quality of the contest as key structural challenges facing these two elections. The contests are generally seen as a fair territory where politicians, especially local officials, have an easy reach over. They have to establish a symbiotic relationship with thebarangay and SK officials, if under the present polity they are to serve the people well. Until the operational, fiscal, and relational structures are modified, the transactions between and among them would largely be driven by partisan political interests. Only certain kinds of individuals are cut for out for this type of work and have the appetite for such relationships. The environment under such elected officials as the barangay and the SK, do not necessarily attract those with a higher intent to serve the village resident, but not willing to go through the rigors of political patronage. This exclusivity appears to also extend to women, who comprise less than 20 percent of the candidates and elected officials at the barangay. Although this statistic holds true for all elective posts, the challenge is not only directed at more inclusion of women, but importantly in the creation of a political environment where village residents and voters see a wide range of leadership types and skills through broadening the base from which voters elect candidates and inclusion of women. Require all candidates to submit a one-page resume that would highlight their skills and capacities, and respond to two key questions: a) what motivated them to participate in the elections; and b) what they see as key challenges when they get elected and get to actually perform their role; and publicize these pieces of information. Collect data on number of women and other differently-gendered individuals candidates and eventually elected, for each barangay, disaggregated by type of election, and publicize them. Publicize all election results for all candidates, not just those who have won. The data should be disaggregated by barangay and by type of election. Publish all statements of contributions and expenditures (SOCE) of all candidates, including a list of those who failed to submit them; disaggregated by province, municipality and barangay. For its part, Namfrel will mobilize its chapters to field election observers in some of the barangays throughout the country.